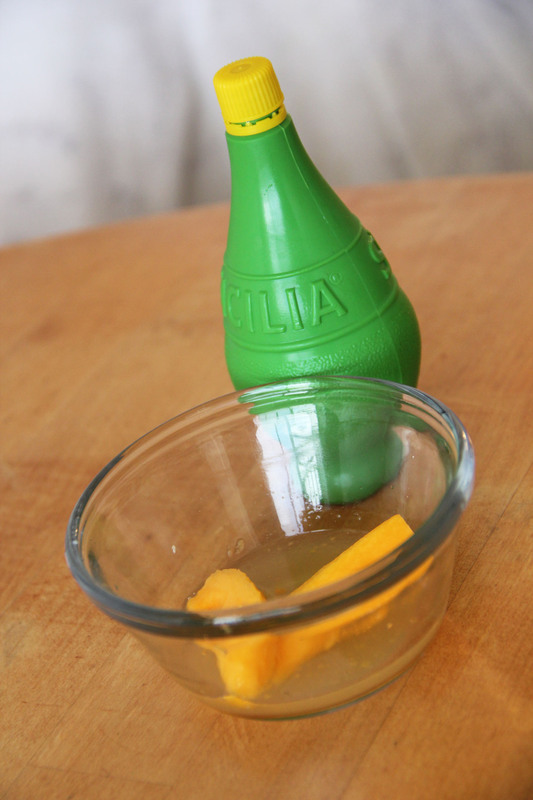 Pears take the spotlight this week in my dehydration project series! Welcome to my first go at drying pears and pear fruit leather. 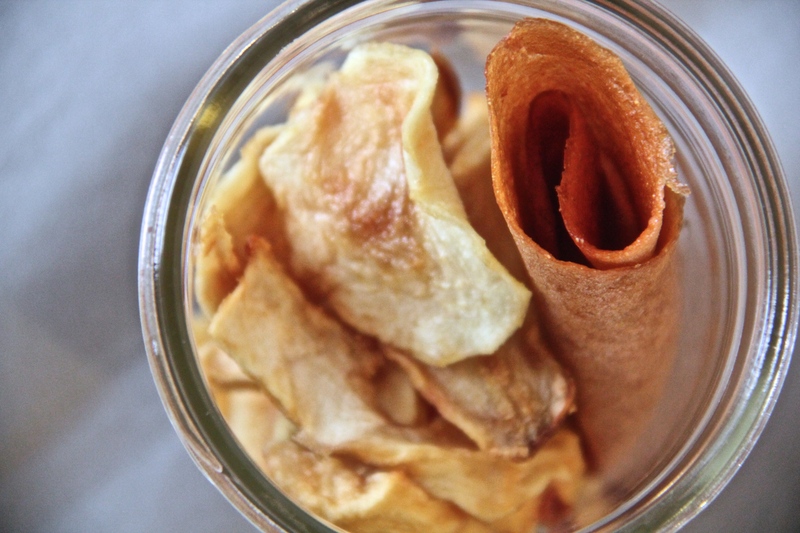 Homemade pear fruit leather is one of my all-time favorite childhood snacks. Recently, I asked my mom how she made it. I discovered she would use the leftover pears she canned from the previous year to make the leather. Since the canned pears were already processed with sugar and pre-treatment, she would simply blend the pears for the leather. Back then, if I knew this fact I would have not eaten any of the canned pears to hold out for more leather! Anyway, for this post I used only fresh pears (no canned). I made one batch of pear slices and another batch of fruit leather. 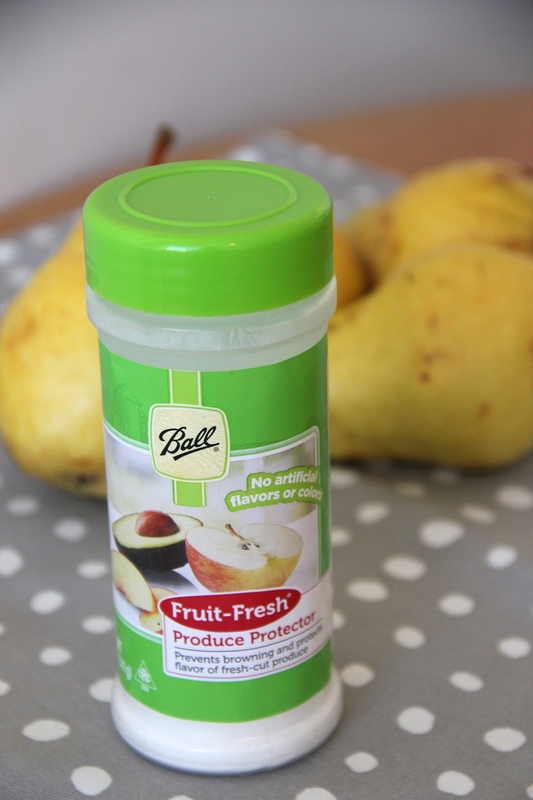 Whether your dry pears whole or make leather, it is important to pre-treat your pears before you dry them. This will prevent them from browning. I used a “fruit-fresh” produce protector (ascorbic acid mixture), but I have heard you can use lemon juice or pure ascorbic acid as well. 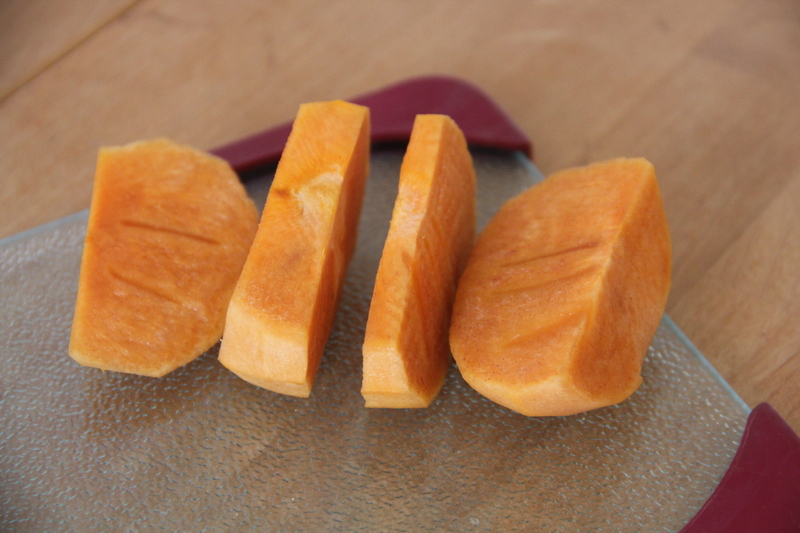 First, I peeled, cored, and sliced the pears into 1/4 – 1/2 inch thick pieces. I placed them in a tupperware container to coat them with the pre-treatment. I recommend following the directions associated with the product you use. For me, I mixed 2 tsp. preservative with 3 Tbsp. water, and tossed to coat the fruit. I then let it sit for 10-15 minutes. Dry them at a temperature of 135 degrees F.
Remove individual pieces when dry. Some will dry quicker than others. Total dry time took between 11 and 13 hours. 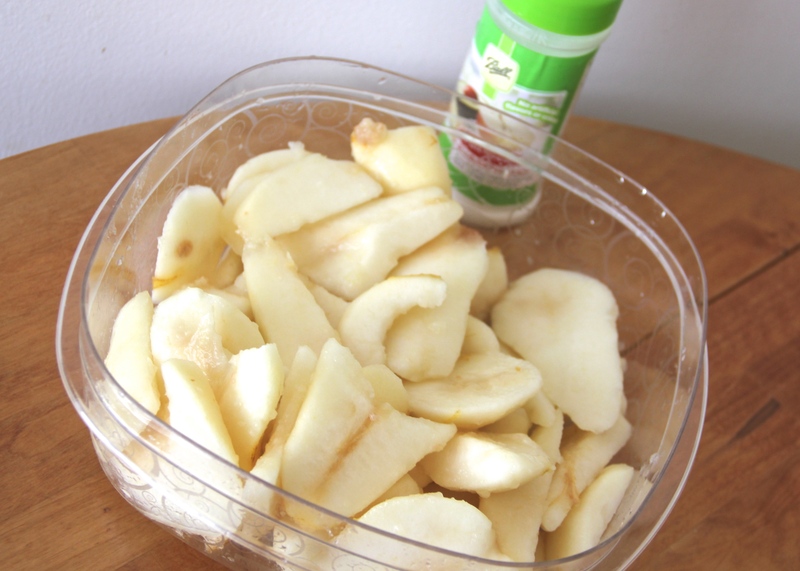 The results were nice moist pear tidbits- love it! Dry at a temperature of 135 degrees F.
Total dry time only took 5 hours. Welcome to the 4th episode of my “dehydration project” series. 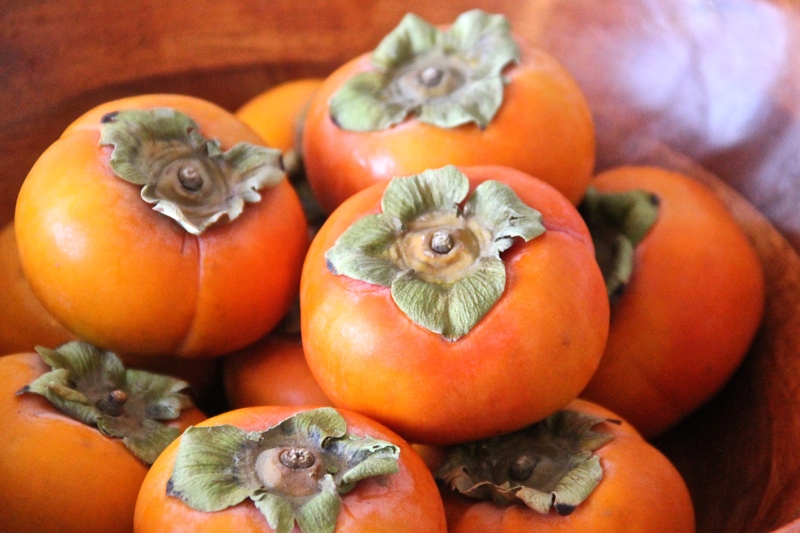 I choose fruits that are in season to work with, so that means persimmons are on the menu this week! 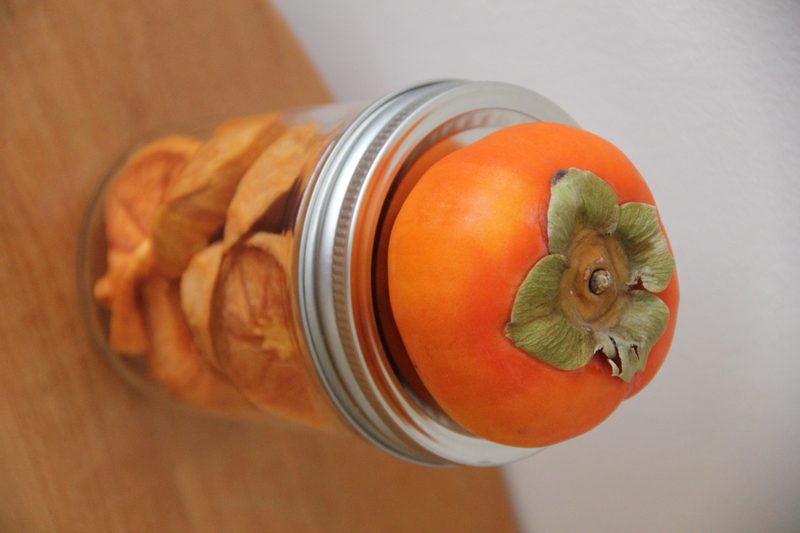 Peel the persimmons and remove green stem. 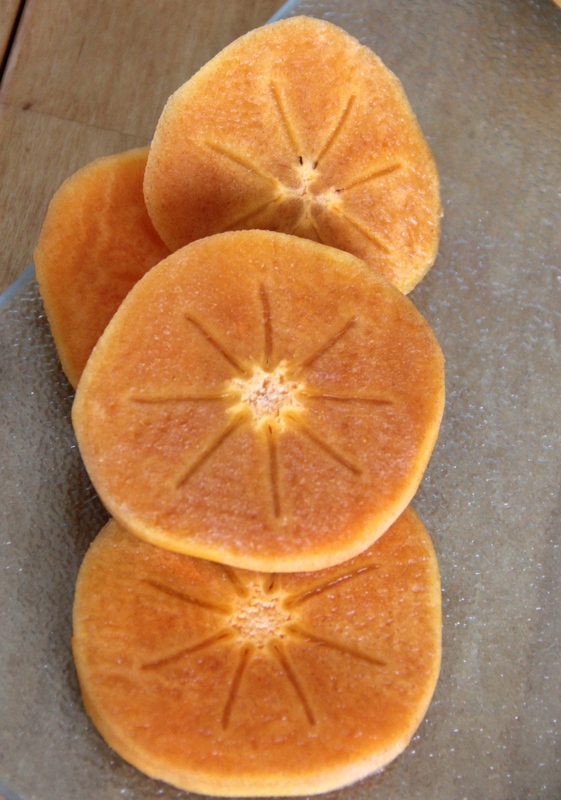 Cut the persimmons into quarters. Place on dehydrator trays and dry at a temperature of 135 degrees F.
Dry for about 6 hours, or until desired texture is achieved. The texture was great, however, make sure the persimmons are ripe! I used persimmons that were still hard (like an apple), but that is not ideal. 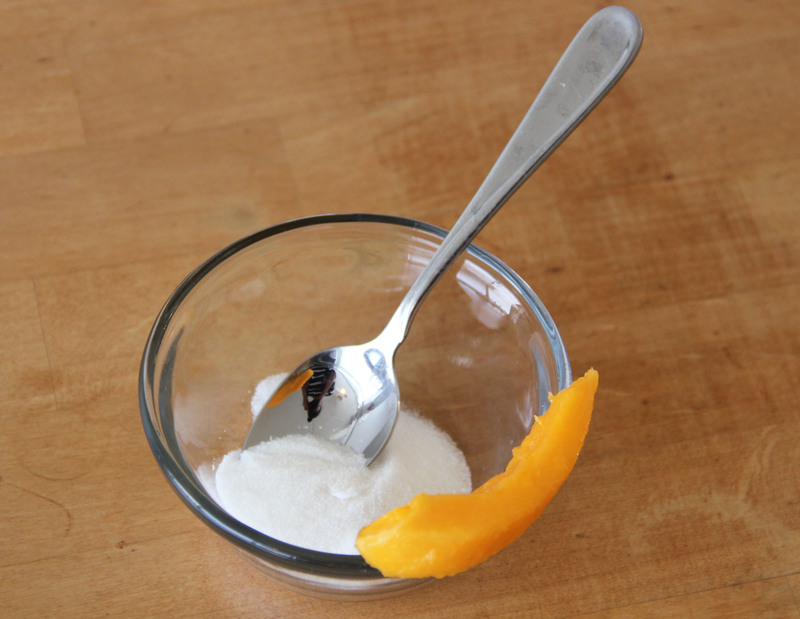 Wait until persimmons are soft to the touch (like a tomato) and you will see much better results. Side Note: Koreans traditionally dry persimmons whole, hanging them on long strands of thread. They hang these strands outside their home for days to naturally dry. Have any of you ever been huckleberry picking? Huckleberries grow naturally throughout the North-Western part of the U.S. mainland. 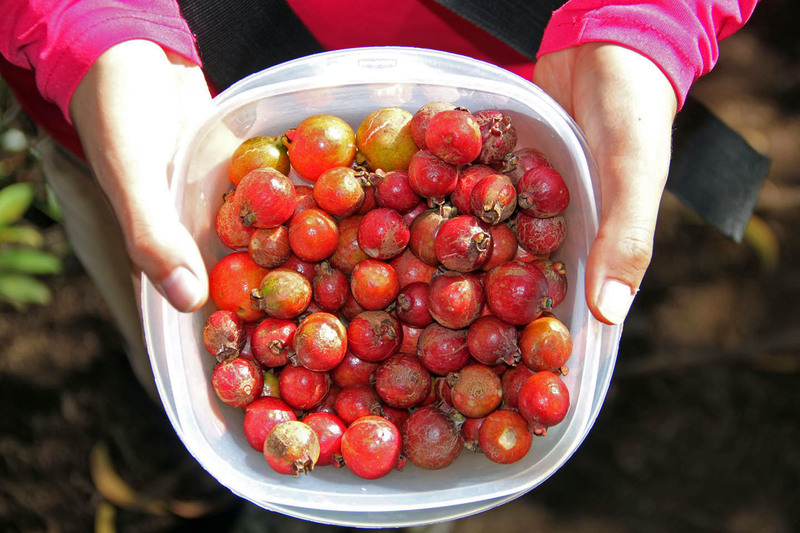 My husband describes the experience as “a berry buffet.” Huckleberries grow in abundance and you can just sit in a patch for hours and devour them. However, harvesting wild guavas takes a lot more work. 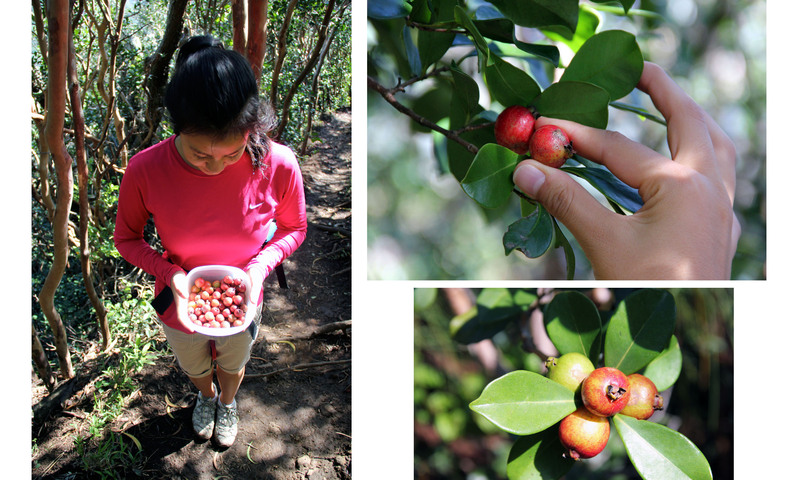 First of all, we had to hike up to the optimal spot to find the guavas. Second, I confess we had to deviate from the trail to more easily access them. And last, we had to pretty much climb the trees for them. We definitely had to ‘work’ for our food. We got about two tupperwares full. Strawberry guavas are not sweet per say. They have a sour kick when eaten. You can eat the fruit whole, the skin is soft and the seeds are chewable. However, we were anxious to try blending them to make dried fruit leather. 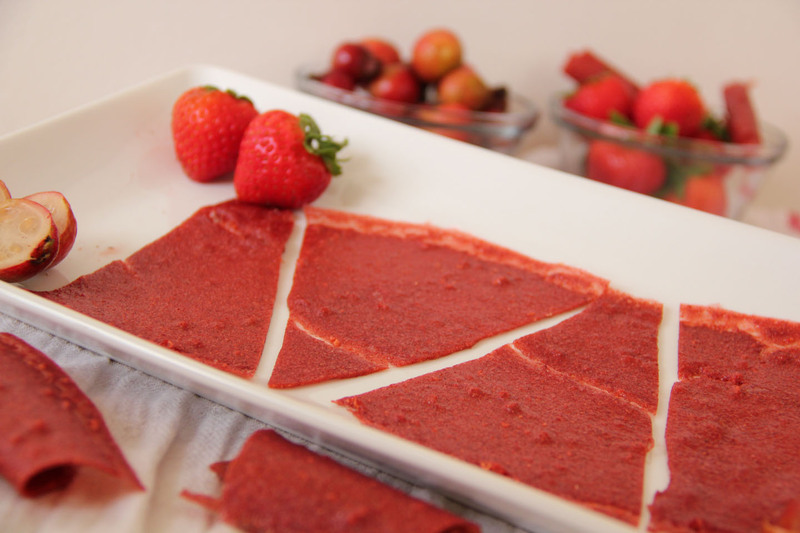 This morning I experimented with strawberries, guavas and natural sweeteners to create an ultimately unique and delicious snack. 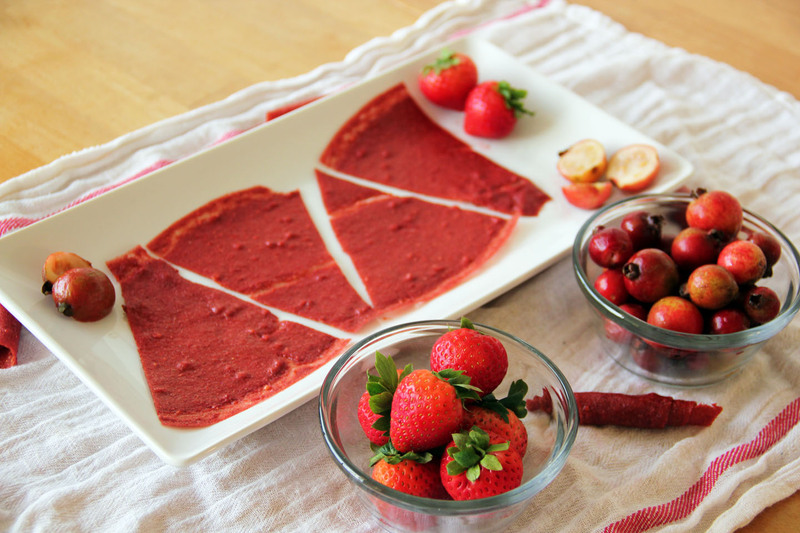 Blend the strawberries, guava and honey in a blender until smooth. 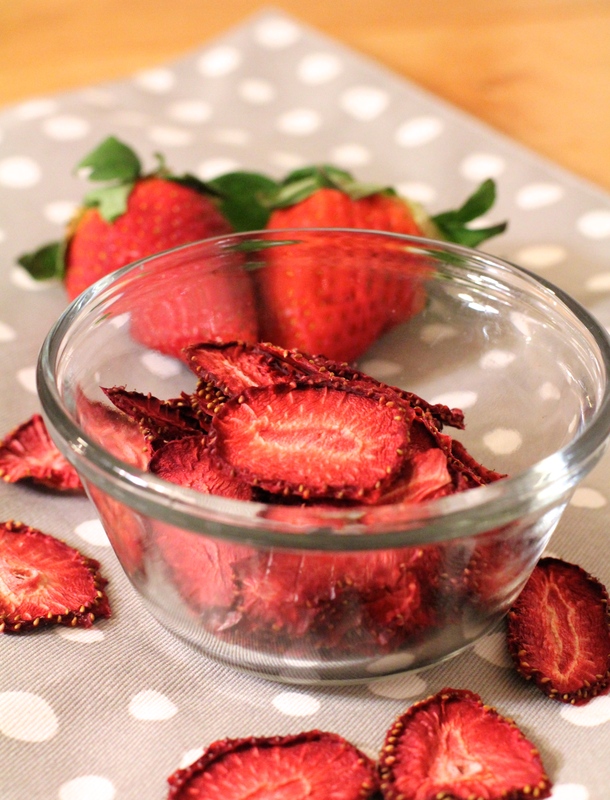 Before you pour the mixture onto the dehydrator tray, spray it with cooking spray so it does not stick. 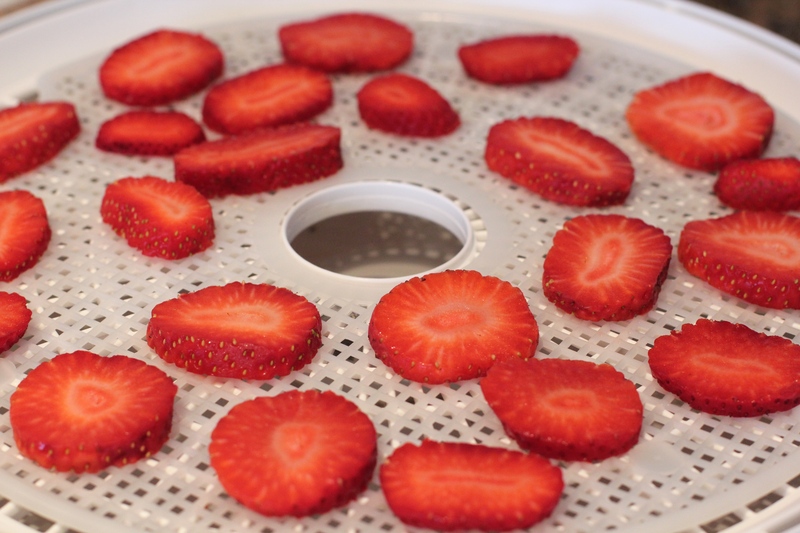 Food dehydrators typically come with trays specifically for fruit leather. Move the mixture around until it evenly coats the tray surface. The quantities in this recipe result in a rather thick leather. The total dry time for me was 8 hours, at a temperature of 135 degrees F.
Blend the strawberries, guava and agave in a blender until smooth. Before you pour the mixture on the tray, spray it with cooking spray to avoid sticking. Make sure the mixture evenly coats the tray. The quantities of this recipe were smaller than the first, so the total dry time was 6.5 hours, at a temperature of 135 degrees F.
Bottom Line: Amazing! The strawberries, plus the guava and sweetener create such a unique and delectable taste. It was sweet, with a little kick- just like a tropical fruit punch. The only problem I had with the outcome were the seeds. Blending the skin of the strawberry guava made no difference, but the seeds were quite pronounced in the leather. Next time I will deseed the strawberry guavas before blending. Other than that, I highly recommend! This is episode #3 of my dehydration project series. If you guys have any fruits or vegetables you would like me to attempt to dry, feel free to leave ideas in the comments below and I will do it! Welcome to trial #2 of the dehydration project, dried papaya. It’s easy to find recipes for common fruits, such as apples and strawberries. I have yet to find decent information for drying papaya. It may be because Hawaii is the only state to commercially produce papaya. Nevertheless, my new mission is to find the optimal recipe for drying papaya and share it with you. 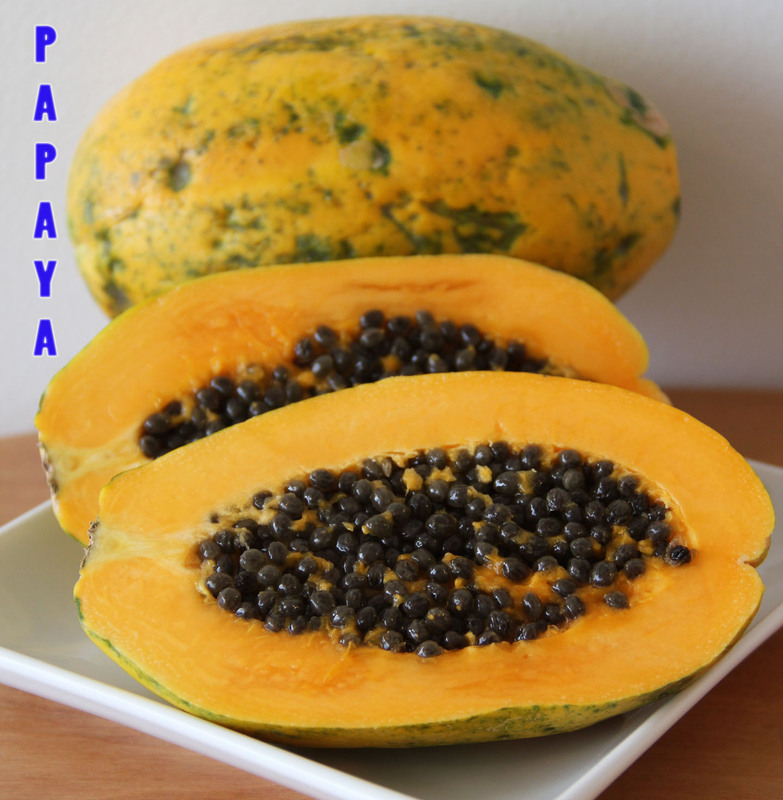 Have you tasted or even seen a papaya fruit? I never knew what papaya looked like until I moved to the Islands. I remember the first time I tried papaya. I took a tropical fruits class in college (I know right?! Only in Hawaii…) My teacher introduced us to papaya. He served it with lime juice to enhance the flavor. I don’t particularly care for raw papaya, but dried papaya = big fan. 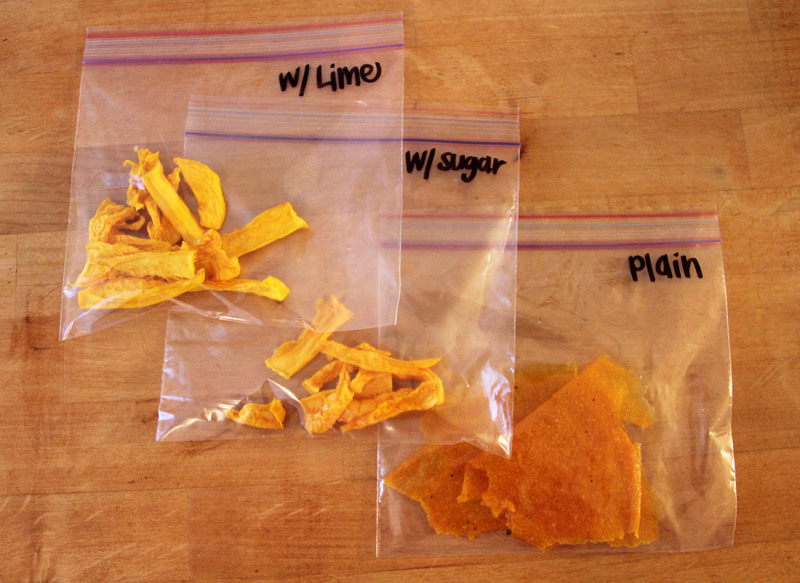 I typically have a stash of store-bought dried papaya in my kitchen. The sugary-processed taste of it bugs me though. I hope that through drying my own papaya I will be able to preserve the natural flavor and sweetness for a fantastic snack! Use papayas that are ripe. They usually are green when you buy them at the store, but you will need to wait a few days for them to ripen. You will know they are ripe when they are mostly yellow and feel soft. First, peel the skin off the papayas. Cut them in half and scoop out the guts (seeds). Proceed to slice into the desired shape/size. Next, treatment. I have never dried papaya before so I was truly experimenting. Tray #3: No pre-treatment- au naturale. In this trial run I also ended up doing a tray of papaya fruit leather. I had some extra papaya that got mushed. 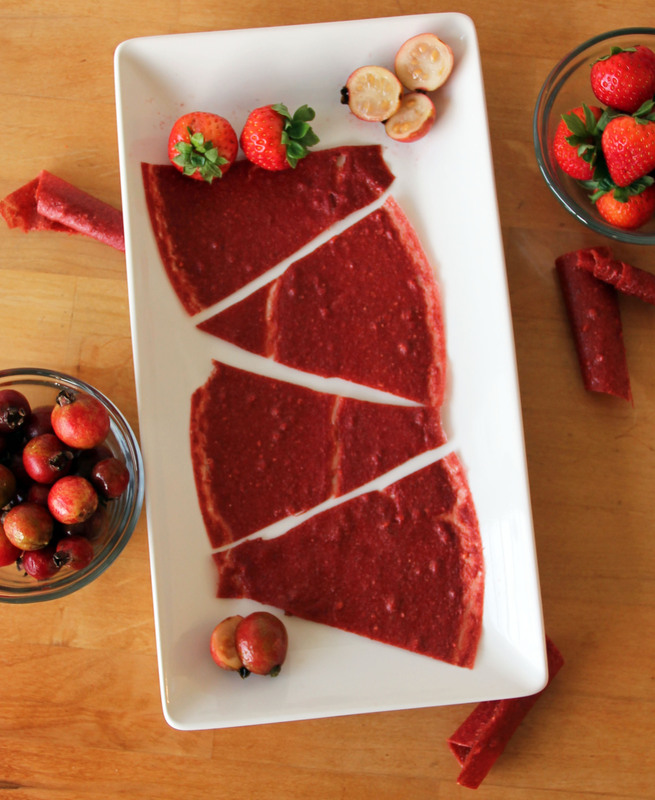 On a whim, I pureed it in a blender and poured on the fruit leather tray of my dehydrator. 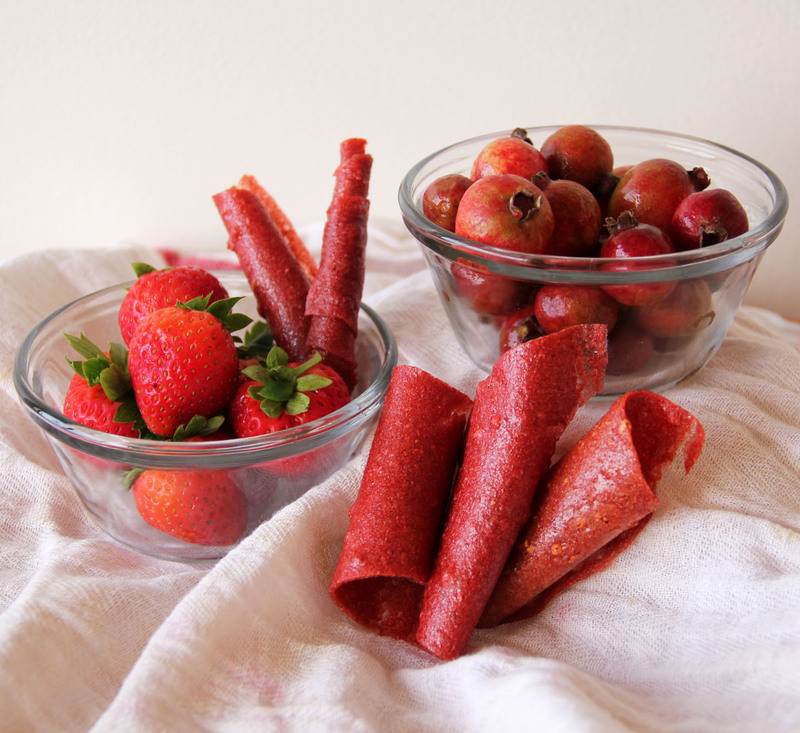 I set the temperature on the dehydrator to 135 degrees F.
The total dry time for the fruit leather ended up being about 6 hours. The slices nearest to the dehydrator base took only 6 hours to completely dry. Slices further away from the trays took closer to 7 hours to dry. Lime= Epic Fail. When I tasted it I thought I was going to have to toss the whole batch out. It’s not all despair though, my husband liked it. In this case it depends on your personal preference. Sugar= This was by far my favorite! I was hoping I would like the natural one, but unfortunately with papaya adding sweetener is a must! Natural= Yuck. It tasted just like papaya. For some people that is wonderful. I really hate fresh papaya though. I need the sweetener to stomach it. The texture is great though. This post launches my new series called “The Dehydration Project.” I love eating dried fruit, but after I lived in Korea my taste buds changed. Now, I cannot tolerate the amount of sugar American companies put in store bought dried fruit. I just received a food dehydrator for my birthday and I am super excited. I have always wanted to make my own dried fruit. 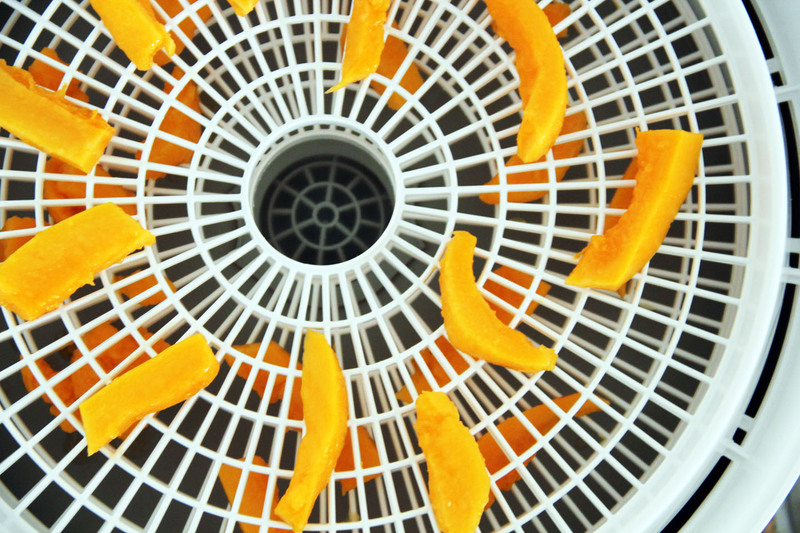 Drying your own fruit is not only economical, but also gives you control over the sugar content. The only problem is I have never actually tried drying my own fruit before. This is the initial step in my series of dehydration “experiments.” I will post my trials, methods, and outcomes as I try to search for the optimal way to dry fruit. Stay tuned as I try to dry papaya, mango, sweet potato, and much more. Trial #1: Dried Pineapple! Method: I began by using a “pineapple corer” tool to cut the pineapple. 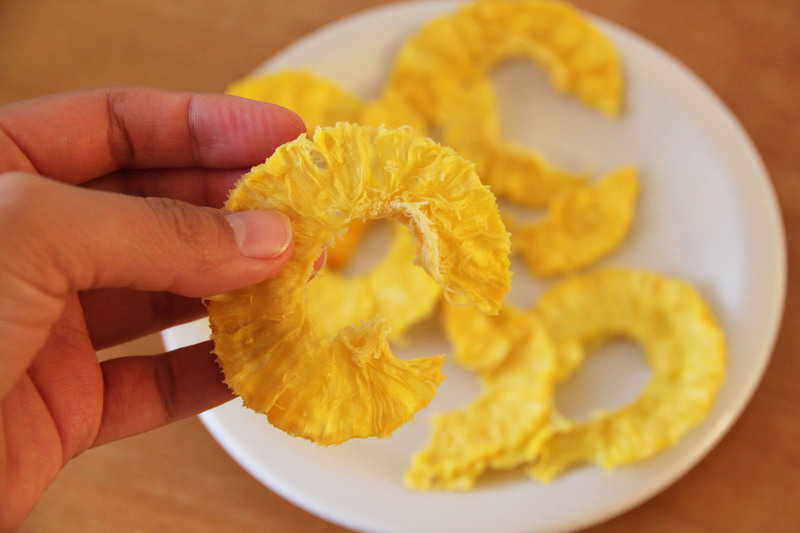 You are supposedly suppose to insert it into the top of the pineapple, pushing and twisting down, creating a perfectly cut, cored, and ringed pineapple. Easier said than done. I really struggled with it. As I tried to push the tool down, pineapple juice filled up the space. Long story short, I made a huge mess! I will need to figure out how to use that tool later… So for trial #1 I ended up with one tray of sliced rings and another tray of pineapple guts (“tidbits”). 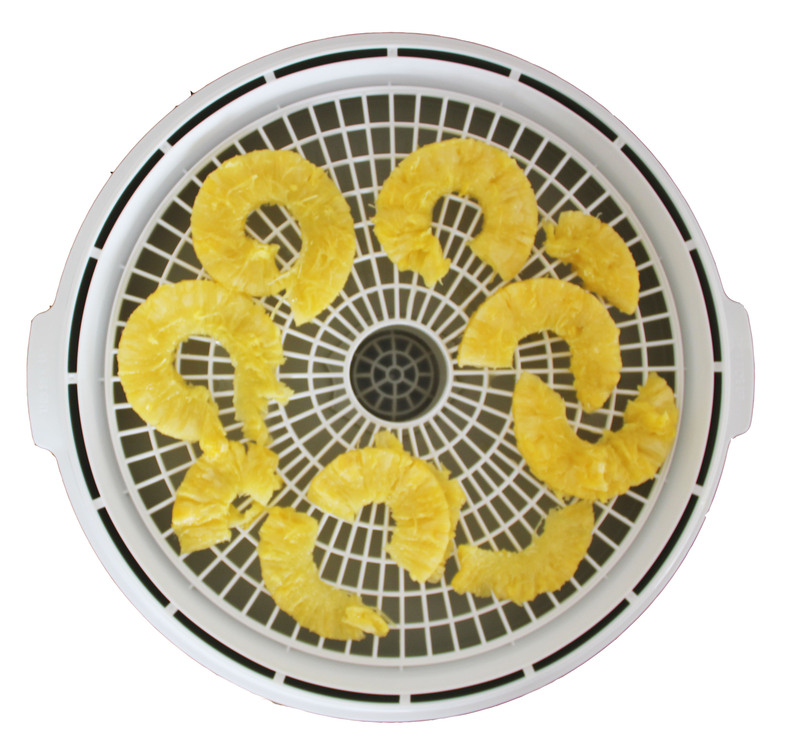 Outcome: I set the temperature on the dehydrator to 135 degrees and it took 6 hours to sufficiently dry the pineapple pieces. Keep in mind, I only had 2 trays operating. More trays=more time. Taste: It tasted just like fresh pineapple. No frills or pre-treatment. Just a raw, natural sweet Hawai’i singing’-aloha in my mouth. *You can make the rings thicker, depending on desired thickness and texture. Stay Tuned for trial #2: papaya.